This very large bow gives you 115" yards of ribbon on one French clip, WOW! This 101 Dalmations Show Bow has tons of spots, paw prints and black and white all over to help you remember the little dogs of the show. The base bottom bow is 2.25" of white grosgrain ribbon with a 1.5" black grosgrain ribbon wrapped on top. Then two 5/8" grosgrain ribbons cross each other, one is black with white polka dots and the other is white with black spots. 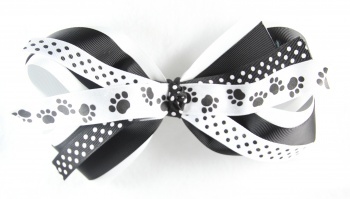 Then the center of the bow has a strip of white satin ribbon with black dog prints running by, all wrapped together by a black with white polka dots grosgrain ribbon. What a lot of ribbon you will get with this bow!